Finally, in part 4, we’ll examine how the GDPR can help in customer experience, and provide a couple of case studies. .
You can also download the complete GDPR: Impact to Your Data Management Landscape white paper. 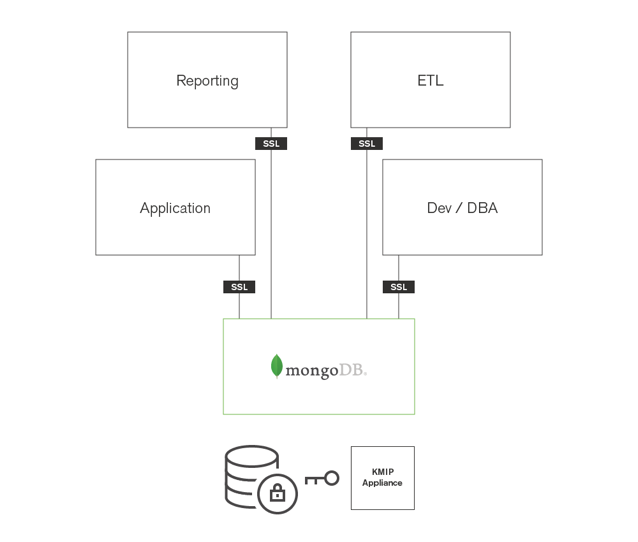 This article details features of MongoDB Enterprise Advanced as they relate to GDPR.As of June 2018, MongoDB Atlas offers the same LDAP, auditing, log redaction, and encrypted storage engine features of MongoDB Enterprise Advanced. Also note that with the 4.0 release, MongoDB’s default authentication has been upgraded to SHA-256. These requirements inform the security architecture of MongoDB, with best practices for the implementation of a secure, compliant data management platform. 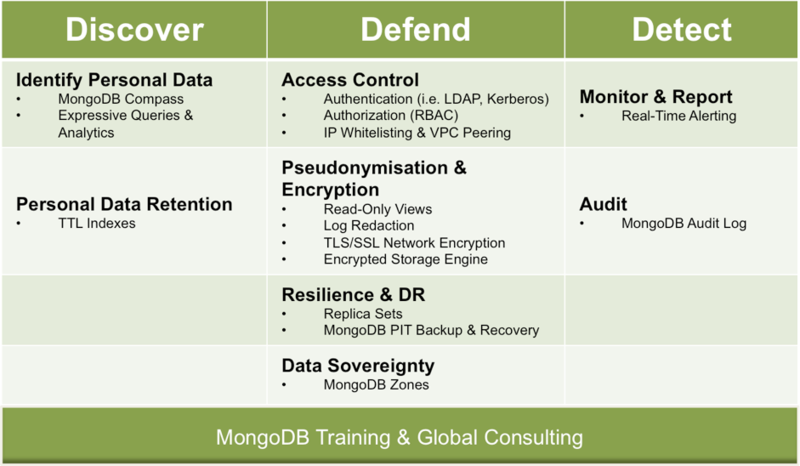 Using the advanced security features available in MongoDB Enterprise Advanced and the MongoDB Atlas cloud database service, organizations have extensive capabilities to implement the data discovery, defense, and detection requirements demanded by the GDPR. There are multiple ways to inspect database content. The most common method is to query the database and extract all records to identify the tables and rows (collections and documents, in MongoDB terminology) containing user data. However, this approach also requires significant manual analysis of the schema to track what data is stored, and where, while imposing processing overhead on the database itself. MongoDB provides a much simpler approach with Compass, the GUI for MongoDB. 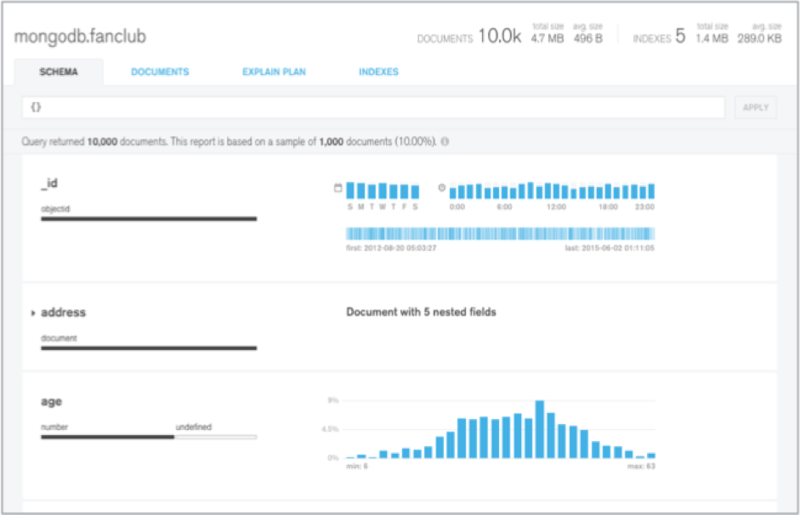 Compass enables users to visually explore their data, providing a graphical view of their MongoDB schema by sampling a subset of documents from a collection, thereby minimizing database overhead and presenting results to the user almost instantly. Schema visualization with MongoDB Compass enables the user to quickly explore their schema to understand the frequency, types, and ranges of fields in each data set. The user doesn’t need to be conversant with the MongoDB query language – powerful ad-hoc queries can be constructed through a point and click interface, opening up the discovery and data loss prevention process beyond developers and DBAs to Data Protection Officers and other business users. Beyond Compass, the MongoDB query language and rich secondary indexes enable users to query and analyze the data in multiple ways. Data can be accessed by single keys, ranges, text search, graph, and geospatial queries through to complex aggregations, returning responses in milliseconds. Data can be dynamically enriched with elements such as user identity, location, and last access time to add context to Personally Identifiable Information (PII) , providing behavioral insights and actionable customer intelligence. Complex queries are executed natively in the database without having to use additional analytics frameworks or tools, and avoiding the latency that comes from ETL processes that are necessary to move data between operational and analytical systems in legacy enterprise architectures. Through the use of the special-purpose TTL (Time-To-Live) index, administrators can automate the expiration of EU citizen data from a database. By configuring the required retention period against a date field in the document (i.e. the date on which the user data was collected or last accessed), MongoDB will delete the document once the period has been reached, using an automated background process that runs against the database every 60 seconds. Compared to implementing expiration code at the application level, which must then regularly scan the database to find records that need to be deleted, the MongoDB TTL index dramatically simplifies the enforcement of data expiration policies. It also imposes significantly lower database overhead. Authentication, designed to confirm the identity of clients accessing the database. Authorization, governing what that client is entitled to do once they have access to the database, such as reading data, writing data, performing administrative and maintenance activities, and more. MongoDB provides multiple authentication methods, allowing the approach best suited to meet the requirements of different environments. Authentication can be managed from the database itself, or through integration with external authentication mechanisms. MongoDB Atlas enforces in-database authentication via the SCRAM IETF RFC 5802 standard. As the MongoDB Atlas service runs on public cloud platforms, it also implements additional security controls to reduce the risk of unauthorized access. An Atlas cluster by default will disallow direct access from the internet. Each Atlas cluster is deployed within a virtual private environment (e.g., AWS or GCP Virtual Private Cloud, Azure Virtual Network), and that private environment is by default configured to allow no inbound access. Also IP whitelisting can be used to restrict network access to a database (i.e., application servers are prevented from accessing the database unless their IP address has been added to the whitelist for the appropriate MongoDB Atlas group) The Atlas AWS VPC peering option allows peering an organization’s Atlas network to its own AWS VPC network, thereby ensuring network traffic never traverses the public internet, and instead uses the internal private network. MongoDB Enterprise Advanced also allows SCRAM authentication, with additional integration options for LDAP, Kerberos, or x.509 PKI certificates. LDAP is widely used by many organizations to standardize and simplify the way large numbers of users are managed across internal systems and applications. In many cases, LDAP is also used as the centralized authority for user access control to ensure that internal security policies are compliant with corporate and regulatory guidelines. With LDAP integration, MongoDB Enterprise Advanced can both authenticate and authorize users directly against existing LDAP infrastructure to leverage centralised access control architectures. MongoDB Enterprise Advanced also supports authentication using a Kerberos service. Through LDAP and Kerberos, MongoDB Enterprise Advanced provides support for authentication using Microsoft Active Directory. The Active Directory domain controller authenticates MongoDB users and servers running in a Windows network, again to leverage centralised access control. With support for x.509 certificates MongoDB also can be integrated with Certificate Authorities (CA), supporting both user and inter-node cryptographic authentication, reducing risks found in passwords or keyfiles. Review the Authentication section of the documentation to learn more about the different mechanisms available in MongoDB Enterprise Advanced. Over ten predefined roles supporting common user and administrator database privileges provide Role Based Access Control (RBAC) capabilities. With MongoDB Enterprise Advanced, these can be further customised through User Defined Roles, enabling administrators to assign fine-grained privileges to clients, based on their respective data access and processing needs. To simplify account provisioning and maintenance, roles can be delegated across teams, ensuring the enforcement of consistent policies across specific data processing functions within the organization. MongoDB Enterprise Advanced also supports authorization via LDAP, in addition to authentication discussed above. This enables existing user privileges stored in a LDAP server to be mapped to MongoDB roles, without recreating users in MongoDB itself. This integration strengthens and simplifies access control by enforcing centralised processes. 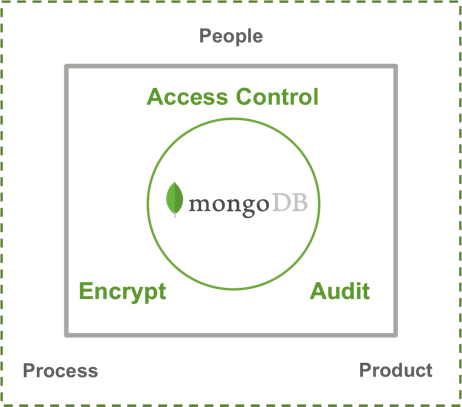 Review the Authorization section of the documentation to learn more about role-based access control in MongoDB. As discussed in part 2, pseudonymisation and encryption of data is designed to prevent the identification of any specific individual in the event of data being accessed by an unauthorized party. MongoDB provides multiple levels of pseudonymisation. Through read-only views, MongoDB can automatically filter out specific fields, such as those containing PII of citizens when a database is queried. Rather than query collections directly, clients can be granted access only to specific, predefined views of the data. Permissions granted against the view are specified separately from permissions granted to the underlying collection, and so clients with different access privileges can be granted different views of the data. Read-only views allow the inclusion or exclusion of fields, masking of field values, filtering, schema transformation, grouping, sorting, limiting, and joining of data across multiple collections. Read-only views are transparent to the application accessing the data, and do not modify the underlying raw data in any way. MongoDB Enterprise Advanced can also be configured with log redaction to prevent potentially sensitive information, such as personal identifiers, from being written to the database’s diagnostic log. Developers and DBAs who may need to access the logs for database performance optimization or maintenance tasks still get visibility to metadata, such as error or operation codes, line numbers, and source file names, but are unable to see any personal data associated with database events. Encryption can protect data in transit and at rest, enabling only authorized access. Should unauthorized users gain access to a network, server, filesystem or database the data still can be protected with encryption keys. Support for Transport Layer Security (TLS) allows clients to connect to MongoDB over an encrypted network channel, protecting data in transit. In addition, MongoDB encrypts data at rest in persistent storage and in backups. Using the MongoDB Atlas managed database service, TLS is the default and cannot be disabled. Traffic from clients to Atlas, and between Atlas cluster nodes, is authenticated and encrypted. Encryption-at-rest is an available, no-cost option for customers using the public cloud providers’ disk and volume encryption services. MongoDB Enterprise Advanced also offers the Encrypted Storage Engine, making the protection of data at-rest an integral feature of the database. By natively encrypting database files on disk, administrators reduce both the management and performance overhead of external encryption options, while providing an additional level of defense. Only those staff with the appropriate database credentials can access encrypted personal data. Access to the database file on the server would not expose any stored personal information. The storage engine encrypts each database with a separate key. MongoDB recommends encryption keys be rotated and replaced at regular intervals, and by performing rolling restarts of the replica set, keys can be rotated without database downtime. Database files themselves do not need to be re-encrypted when using a Key Management Interoperability Protocol (KMIP) service, thereby also avoiding the performance overhead incurred with key rotation. Refer to the documentation to learn more about encryption in MongoDB. Resilience and Disaster Recovery To protect service availability and recover from events that cause data corruption or loss, MongoDB offers fault tolerance to systems failures, along with backup and recovery tools for disaster recovery. Using native replication, MongoDB maintains multiple copies of data in what are called replica sets. A replica set is a fully self-healing cluster distributed across multiple nodes to eliminate single points of failure. In the event a node fails, replica failover is fully automated, eliminating the need for administrators to intervene manually to restore database availability. The number of replicas in a MongoDB replica set is configurable: a larger number of replicas will provide increased data availability and protection against database downtime (e.g., in case of multiple machine failures, rack failures, data center failures, or network partitions). Replica sets also provide operational flexibility by providing a way to upgrade hardware and software without requiring the database to be taken offline. Replica set members can be deployed both within and across physical data centers and cloud regions, providing resilience to regional failures. Data can be compromised by a number of unforeseen events: failure of the database or its underlying infrastructure, user error, malicious activity, or application bugs. With a backup and recovery strategy in place, administrators can restore business operations by quickly recovering their data, enabling the organization to meet regulatory and compliance obligations. The operational tooling provided as part of MongoDB Enterprise Advanced and the MongoDB Atlas managed database service can continuously maintain database backups for you. If MongoDB experiences a failure, the most recent backup is only moments behind the operational system, minimizing exposure to data loss. The tooling offers point-in-time recovery of replica sets and cluster-wide snapshots of sharded clusters. These operations can be performed without any interruption to database service. Administrators can restore the database to precisely the moment needed, quickly and safely. Automation-driven restores allow a fully configured cluster to be re-deployed directly from the database snapshots in a just few clicks, speeding time to service recovery. You can learn more about backup and restore in MongoDB Enterprise Advanced from the Ops Manager documentation, and from the documentation for MongoDB Atlas. This section has been updated to reflect current MongoDB Atlas and Enterprise Advanced capabilities. To support data sovereignty requirements, MongoDB zones allow precise control over where personal data is physically stored in a cluster. Zones are also the basis for Atlas's fully managed Global Clusters. Clusters can be configured to automatically “shard” (partition) the data based on the user’s location – enabling administrators to isolate EU citizen data to physical facilities located only in those regions recognised as complying with the GDPR. If EU policies towards storing data in specific regions change, updating the shard key range can enable the database automatically to move personal data to alternative regions. You can learn about Global Clusters from the Atlas documentation. Proactive monitoring of all components within an application platform is always a best practice. System performance and availability depend on the timely detection and resolution of potential issues before they present problems to users. Sudden and unexpected peaks in memory and CPU utilization can, among other factors, be indicative of an attack, which can be mitigated if administrators are alerted in real time. The operational tooling provided with MongoDB Enterprise Advanced and the MongoDB Atlas managed database service provide deep operational visibility into database operations. Featuring charts, custom dashboards, and automated alerting, MongoDB’s operational tooling tracks 100+ key database and systems health metrics including operations counters, memory, CPU, and storage consumption, replication and node status, open connections, queues, and many more. The metrics are securely reported to a management UI where they are processed, aggregated, alerted, and visualized in a browser, letting administrators easily track the health of MongoDB in real time. Metrics can also be pushed to Application Performance Management platforms such as AppDynamics and New Relic, supporting centralised visibility into the global IT estate. Custom alerts can be generated when key metrics are out of range. These alerts can be sent via SMS and email, or integrated into existing incident management and collaboration systems such as PagerDuty, Slack, HipChat, and others to proactively warn of potential issues and help prevent outages or breaches. The operational tooling also enables administrators to roll out upgrades and patches to the database without application downtime. Using the MongoDB Atlas database service, patches are automatically applied, removing the overhead of manual operator intervention. By maintaining audit trails, changes to personal data and database configuration can be captured for each client accessing the database, providing a log for compliance and forensic analysis by data controllers and supervisory authorities. Administrative actions such as adding, modifying, and removing database users, schema operations, and backups. Authentication and authorization activities, including failed attempts at accessing personal data. Read and write operations to the database. Administrators can construct and filter audit trails for any operation against MongoDB Enterprise Advanced. They can capture all activities, or just a subset of actions, based on the requirements stipulated by the data controller and auditors. For example, it is possible to log and audit the identities of users who accessed specific documents, and any changes they made to the database during their session. Learn more from the MongoDB Enterprise Advanced auditing documentation. The MongoDB Atlas managed database service provides an audit log of administrative actions, such as the deployment and scaling of clusters, and addition or removal of users from an Atlas group. Database log access is also provided that can be used by controllers to track user connections to the database. The MongoDB Security course is a no-cost, 3-week online training program delivered by MongoDB University. MongoDB University also offers a range of both public and private training for developers and operations teams, covering best practices in using and administering MongoDB. MongoDB Global Consulting Services offer a range of packages covering Health Checks, Production Readiness Assessments, and access to Dedicated Consulting Engineers. The MongoDB consulting engineers work directly with your teams to guide development and operations, ensuring skills transfer to your staff. That wraps up the third part of our 4-part blog series. In Part 4, we’ll examine how the GDPR can help in customer experience, and provide a couple of case studies. Remember, if you want to get started right now, download the complete GDPR: Impact to Your Data Management Landscape white paper today. Welcome to part 2 of our 4-part blog series. If you can’t wait for all 4 parts of the series, but would rather get started now, download the complete GDPR: Impact to Your Data Management Landscape white paper today. “People” defines specific roles, responsibilities, and accountability. “Processes” defines operating principles and business practices. “Products” defines technologies used for data storage and processing. Detect: identify a breach against that data, and remediate security and process gaps. The following section of the post examines GDPR requirements, and maps them back to the required database capabilities. Please note that the list below is illustrative only, and is not designed to be exhaustive. Before implementing security controls, an organization first needs to identify personal data stored in its databases, and for how long the organization is permitted to retain that data. They also need to assess the potential impact to the individual, should the personal data be disclosed to an unauthorized party. It is therefore important to have access to tools that enable the data controller to quickly and conveniently review their database content, and as part of an ongoing discovery process, to inspect what additional data will be captured as new services are under development. Therefore, a required capability that the organization will need to implement is the ability to identify personal data, and securely erase it from the database once the expiration period has been reached, or an individual specifically requests erasure. As a result, storage, including backups, should have the ability to provably erase data as requested by owner. Once the organization has conducted its Discover phase, with an Impact Assessment and expiration policies defined, they need to implement the controls that will protect citizen data. Each of the bulleted clauses is further expanded upon within the GDPR text, as follows. Within the database, it should be possible to enforce authentication controls so that only clients (e.g., users, applications, administrators) authorized by the data processor can access the data. The database should also allow data controllers to define the specific roles, responsibilities, and duties each client can perform against the data. For example, some clients may be permitted to read all of the source data collected on a data subject, while others may only have permissions to access aggregated data that contains no reference back to personal identifiers. This approach permits a fine-grained segregation of duties and privileges for each data processor. One of the most effective and efficient means of pseudonymising data is based on the access control privileges defined in the previous step. The database redacts personal identifiers by filtering query results returned to applications. The database should provide a means to encrypt both data “in-transit” using network connections, and data “at-rest” using storage and backups. As stated in bullets B and C in the “The Security of Processing”, Article 32 cited above, systems and service availability, along with a means to restore data in a timely fashion, are both core operational requirements of the GDPR. As a result, the database needs to offer fault tolerance to systems failures, along with backup and recovery mechanisms to enable disaster recovery. To support globally distributed applications, organizations are increasingly distributing data to data centers and cloud facilities located in multiple countries across the globe. In context of the GDPR, it should be possible for the database to enforce data sovereignty policies by only distributing and storing EU citizen data to regions recognized as complying with the regulation. In the event of a data breach, the organization must be able, in timely fashion, to detect and report on the issue, and also generate a record of what activities had been performed against the data. Monitoring is always critical to identifying potential exploits. The closer to real time, the better chance of limiting the impact of data breaches. For example, sudden peaks in database resource consumption can indicate an attack in progress at the very moment it happens. As a result, the database should offer management tools that enable constant monitoring of database behavior to proactively mitigate threats, and that enable the organization to report on any breaches within the specified timeframes. The database needs to offer a mechanism to record database activity, and present that activity for forensic analysis when requested by the controller. As part of our ongoing series highlighting our partner ecosystem, we recently sat down with Dell EMC Global Alliances Director, Tarik Dwiek and Director of Product Management, Philip Fote, to better understand how Dell EMC and MongoDB partner to help modernize and protect data center operations. What do you want customers to know about the MongoDB and Dell EMC relationship? Tarik: We have been partnering for over a year on Dell EMC Flash and software-defined platforms, and the traction has been amazing. To fully realize the potential of MongoDB, customers need to modernize their infrastructure and transform their data center operations. At Dell EMC, our strategy is to help customers achieve this modernization by taking advantage of 4 key pillars: flash, software-defined, scale-out, and cloud enabled solutions. In addition, we are working on a data protection strategy for enterprise-grade backup and restore of MongoDB. Can you further explain how this strategy relates directly to MongoDB? Tarik: First off, MongoDB unlocks the ability for unparalleled performance at the database layer. This is where Flash is essential, meeting these performance requirements with compelling economics. Second, scale-out architectures, like MongoDB, have become a requirement because customers are generating orders of magnitude more data. Third, many organizations are implementing a software-defined data center. This model automates the deployment and configuration of IT services, resulting in agility and flexibility for managing data services. Finally, we want to ensure that the on-prem data center can leverage public cloud economics non-disruptively. Tell us more about Dell EMC Data Protection solutions. Philip: At Dell EMC, we believe data needs to be protected wherever it lives and no matter what happens. With this in mind, we start with the reality that data protection cannot be one size fits all in terms of service levels. Protection and availability should be based on data value and service levels that align to business objectives. Dell EMC looks at data protection as a continuum that spans over many protection tiers, including availability, replication, backup, snapshots, and archive; we offer products and solutions that span this continuum. With this, customers can tailor their data protection solution to best serve their specific needs. Philip: Dell EMC Data Domain systems deliver industry leading protection storage. Data Domain can reduce the amount of disk storage needed to retain and protect data by ratios of 10-30x and greater. It can scale up to 150 PB of logical capacity managed by a single system and with throughput up to 68 TB/hour. Data Domain systems make it possible to complete more backups in less time and provide faster, more reliable restores. The Data Domain Operating System (DD OS) is the intelligence behind Data Domain systems that makes them the industry’s most reliable and cloud-enabled protection storage. Philip: DD Boost provides advanced integration between Data Domain systems and leading backup and enterprise applications. DD Boost distributes parts of the deduplication process to the backup server or application client to speed backups by up to 50 percent and reduce bandwidth requirements by up to 99 percent. What is DD Boost file system plug-in? Philip: DD Boost is now immediately available for new workloads that were previously unavailable by using a standard file system interface. BoostFS can be deployed in minutes, reducing backup windows and storage capacity. Why did you choose to certify MongoDB with BoostFS? Philip: Dell EMC is committed to providing customers a holistic data protection strategy that evolves with changes in the market. The adoption of NoSQL open source databases is one of those changes, and MongoDB is a market leader. This new partnership with the Data Domain ecosystem will better allow our customers to add MongoDB workloads to their existing infrastructure. BoostFS provides all the benefits and efficiencies of DD Boost, and does so in a simple, cost effective manner. With Dell EMC and MongoDB, customers are now given a valuable, synergistic solution built from two industry leaders. What MongoDB configurations are supported with BoostFS? For more information or to ask questions about BoostFS with MongoDB, please visit the Data Domain Community web site. Philip: As the Product Manager for DD Boost and BoostFS, part of my responsibilities include running the partner ecosystem for DD Boost, so I have a lot experience in dealing with partners. When working in that capacity, it’s easy to separate the good from the bad. Working with MongoDB has been great from the start – they have been responsive, flexible, and proactive in solving problems. Both firms are excited about the solution being offered today, and discussions have already started on extending this solution to cloud use cases. What is the main use case for MongoDB with BoostFS? Philip: One of the main use cases for BoostFS is to provide an enterprise backup and recovery solution with the option to replicate to a remote site. This secondary site can be used for disaster recovery or long term retention. The BoostFS plug-in resides on the MongoDB Ops Manager server as a Linux file system mount point, and the DD Boost protocols transports the data written to the file system, by Ops Manager, to/from the Data Domain. Then backups are replicated using MTree replication to a remote Data Domain system. What are the benefits you’ll get with BoostFS for MongoDB as opposed to Network File System (NFS)? Philip: BoostFS offers advanced features while retaining the user experience you get with NFS, including load balancing and failover plus security. The chart below shows the benefits of BoostFS over NFS. Details on these features can be found on DellEMC.com or at the Data Domain User Community site. What exciting things can we look forward to next from MongoDB and Dell EMC? Tarik: We have invested heavily in hyper-converged infrastructure. More and more customers are seeing the benefits in shifting their focus from maintaining infrastructure to innovating their application. We see tremendous potential in validating and eventually embedding MongoDB into our converged offerings. Modern customers live across multiple channels, creating data with every tweet, comment, swipe, and click. They expect deep personalization based on their interactions with a company's brand and won’t settle for anything less than instant gratification. Customer data is a company’s lifeblood. But it can’t help a company if it’s strewn across an organization, locked away in siloed systems. Designed to alleviate IT organizations’ data burden and empower marketers, Sitecore Experience Database (xDB) is a Big Marketing Data repository that collects all customer interactions, connecting them to create a comprehensive, unified view of the individual customer. Sitecore is a leader in this space and their product makes data available to marketers in real-time, for automated interactions across all channels. xDB is a critical component of Sitecore Experience Platform™, a single platform that allows you to create, deliver, measure, and optimize experiences for your prospects and customers. xDB is powered by MongoDB, and collects and connects all of a customer’s interactions with a company's brand - including those on other customer-facing platforms such as ERP, CRM, customer service, and non-Sitecore websites, creating comprehensive, unified views of each customer. Those views are available to your marketers in real-time to help you create catered customer experiences across all your channels. Sitecore is one of our best and most strategic partners and we are proud to state the relationship is stronger than ever. Recently, Sitecore launched Sitecore® Experience Platform 8.2, which includes new features such as advanced publishing, e-commerce enhancements, and data-at-rest encryption. Encryption is critical component of any application and as a best practice Sitecore recommends that all xDB deployments encrypt-data-at-rest. MongoDB provides a comprehensive native at-rest database encryption through the WiredTiger storage engine. There is no need to use 3rd party applications that may only encrypt files at the application, file system, or disk level. MongoDB’s WiredTiger storage engine is fully integrated and allows enterprises to safeguard their xDB deployments by encrypting and securing customer data-at-rest. MongoDB is the leading non-relational database on the market and an integral part of xDB. It is the ideal database for collecting varied interactions and connecting them to create a “single view” of your customers. Instead of using rows and columns, MongoDB stores data using a flexible document data model, allowing you to ingest, store, and analyze any customer interaction or data type. 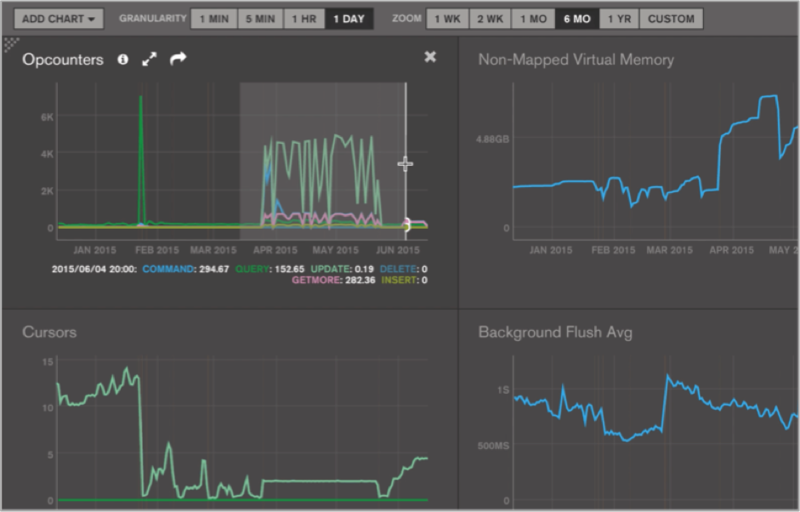 MongoDB enables you to handle up to hundreds of billions of visits or interactions per year. When your deployment hits the scalability limits of a single server (e.g., the CPU, memory, or storage is fully consumed), MongoDB uses a process called sharding to partition and distribute data across multiple servers. Automatic load balancing ensures that performance is consistent as your data grows. The database runs on commodity hardware so you can scale on-demand while keeping costs low. MongoDB supports native data replication with automated failover in the event of an outage. High availability and data redundancy is built into each MongoDB replica set, which serves as the basis for all production deployments of the database. The database’s self-healing architecture ensures that your team will always have access to the tools they need to deliver the best customer experience. MongoDB can be deployed in your data center or in the cloud. MongoDB management tools providing monitoring, backup and operational automation are available for each type of deployment. In xDB, the collection database acts as a central repository for storing contact, device, interaction, history and automation data. An optimal collection database configuration helps organizations increase the availability, scalability, and performance of their Sitecore deployments. With MongoDB, companies can ingest, store, and analyze varied data from billions of visits with ease. MongoDB scales horizontally across commodity servers, allowing customers to cost-effectively grow their deployments to handle increasing data volumes or throughput. We offer a number of products and customized services to ensure your success with SiteCore xDB. If you’re interested in learning more about how we can help, click here and a member of our team will be in touch with you shortly. The MongoDB Deployment for Sitecore consulting engagement helps you create a well-designed plan to deploy a highly available and scalable Sitecore xDB. Our consulting engineer will collaborate with your teams to configure MongoDB’s replication and sharding features to satisfy your organization’s requirements for Sitecore xDB availability and performance. Alan is responsible for Worldwide Partners at MongoDB which include System Integrators, ISVs, and Technology Alliances. Before joining the company, Alan was responsible for WW Cloud & Data Center Automation Sales at BMC Software managing a $200M annual revenue business unit that touched over 1000 customers. Alan has also held senior sales, services, engineering & IT positions at Egenera (a cloud pioneer), Ernst & Young consulting, and the Charles Stark Draper Laboratory. Alan is a graduate of the Massachusetts Institute of Technology, where he earned his B.S. in mechanical engineering and his Masters in aerospace engineering. On the main stage of Amazon’s AWS re:Invent conference in Las Vegas last year, Capital One’s CIO, Rob Alexander made his way into headlines of tech publications when he explained that, under his leadership, the bank would be reducing the number of data centers from 8 in 2015 to just 3 in 2018. Capital One began using cloud-hosted infrastructure organically, with developers turning to the public cloud for a quick and easy way to provision development environments. The increase in productivity prompted IT leadership to adopt a cloud-first strategy not just for development and test environments, but for some of the bank’s most vital production workloads. What generated headlines just a short year ago, Capital One’s story has now become just one of many examples of large enterprises shifting mission critical deployments to the cloud. In a recent report released by McKinsey & Company, the authors declared “the cloud debate is over—businesses are now moving a material portion of IT workloads to cloud environments.” The report goes on to validate what many industry-watchers (including MongoDB, in our own Cloud Brief this May) have noted: cloud adoption in the enterprise is gaining momentum and is driven primarily by benefits in time to market. According to McKinsey’s survey almost half (48 percent) of large enterprises have migrated an on-premises workload to the public cloud. Based on the conventional model of innovation adoption, this marks the divide between the “early majority” of cloud adopters and “late majority.” This not only means that the cloud computing “chasm” has been crossed, but that we have entered the period where the near term adoption of cloud-centric strategies will play a strong role in an organization’s ability to execute, and as a result, its longevity in the market. An additional indication that the “chasm” has been bridged comes as more heavily-regulated industries put down oft-cited security concerns and pair public cloud usage with other broad-scale digitization initiatives. As Amazon, Google, and Microsoft (the three “hyperscale” public cloud vendors as McKinsey defines them) continue to invest significantly in securing their services, the most memorable soundbite from Alexander’s keynote continues to ring true: that Capital One can “operate more securely in the public cloud than we can in our own data centers." As the concern over security in the public cloud continues to wane, other barriers to cloud adoption are becoming more apparent. Respondents to McKinsey’s survey and our own Cloud Adoption Survey earlier this year reported concerns of vendor lock-in and of limited access to talent with the skills needed for cloud deployment. With just 4 vendors holding over half of the public cloud market, CIOs are careful to select technologies that have cross-platform compatibility as Amazon, Microsoft, IBM, and Google continue to release application and data services exclusive to their own clouds. This reluctance to outsource certain tasks to the hyperscale vendors is mitigated by a limited talent pool. Developers, DBAs, and architects with experience building and managing internationally-distributed, highly-available, cloud-based deployments are in high demand. In addition, it is becoming more complex for international business to comply with the changing landscape of local data protection laws as legislators try to keep pace with cloud technology. As a result, McKinsey predicts enterprises will increasingly turn to managed cloud offerings to offset these costs. It is unclear whether the keynote at Amazon’s re:Invent conference next month will once again predicate the changing enterprise technology landscape for the coming year. However, we can be certain that the world’s leading companies will be well-represented as the public cloud continues to entrench itself even deeper into enterprise technology. MongoDB Atlas, the cloud database service for MongoDB, is the easiest way to deploy and run MongoDB, allowing you to get started in minutes. Click here to learn more. The MongoDB team will be at AWS re:Invent this November in Las Vegas and our CTO Eliot Horowitz will be speaking Thursday (12/1) afternoon. If you’re attending re:Invent, be sure to attend the session & visit us at booth #2620!